"Andrew is a huge support to our 8 year old daughter Millie. She's a full time student at the Special Music School at Lucy Moses and we approached him to help us with her home practice. Andrew is patient, kind and is a great motivator. Millie looks forward to her time with Andrew and has developed a more focused passion for piano. "Andrew has been the ideal piano teacher for me. It seemed like all of my friends played at least one instrument, and I'd never learned how to play much of anything. I thought, at 31, it was about time to learn how to play music and started taking piano lessons with Andrew about a month or two ago. First off, Andrew is very professional, on time, and has even given me reminders about our lessons. While being reliable is certainly important, my favorite thing about Andrew is his relaxed vibe. As an adult who is learning how to play music for the first time, I get can get frustrated easily and making mistakes make me anxious. This is where Andrew's patience and calmness is very helpful. He's very positive and encouraging, which does wonders to keep me from getting discouraged and giving up on the whole thing. While I can't sing his praises enough, a final bit to note is that he is great at teaching you whatever song you want. I asked about a song last week that he was familiar with, but didn't know how to play. He just had to listen to it once to figure it out and was able to teach me the whole song in that lesson. I think Andrew's creativity, patience, openness, and reliability all go into making me proud to call him my piano teacher!" "Andrew is much better than our last piano teacher! He teaches me a wide variety of music ranging from classical pieces to new modern pieces. I always look forward to the day of the week when he comes over and can teach and give me new songs and assignments. Andrew almost always gives me a new song every week to keep things fresh and new. He is by far one of the best piano teachers I have ever had the pleasure of learning from!" "I've been working as a music producer/composer in the advertising industry for almost five years now. I've been in a bunch of rock bands and electronic music acts for years now, too, but I had never really had any formal piano training and I've just learnt songs and pieces by ear. Recently, I decided I wanted to fast track my musicianship so i decided to get lessons from Andrew. He has a progressive and flexible teaching style that really suits me. I've been learning complicated classical pieces and classic pop songs with him in in such a short timeframe. He really has shown me that anything is possible!" i love playing the piano with my teacher andrew. we sing and play together. it is so much fun! "I don't meet many people filled with integrity and genuine love for what they do. You do what you do and you do it well. Andrew has shared his love for music by aiding in putting together a music project of mine that will be sent to a recording label. I honestly can say that he truly embodies what a musician is. Andrew is also teaching me how to play this magnificent instrument (the piano). He makes an adult like me less insecure about learning something new at my age. I appreciate his patience with me and professionalism. I pray we continue working together." He lets you put stickers on the songs you pass. He’s really nice. Andrew is very nice and patient. He lets you choose songs of your choice to play on the piano and lets you pick a sticker to put near your song if you get it right. And he is fun to talk to! Overall, he is a great piano teacher! "I came to Andrew in the middle of a writing fellowship in which I'd been given the year to write a manuscript of poetry. I had some free time, and wanted to learn a skill that I felt would give me a break from writing while still keeping me creatively engaged. After a few lessons covering the basics, Andrew took the time to inquire about what I really wanted to get out of our time together, and was really flexible when I'd come into lessons with new ideas. I learned basic chord structures, inversions, and creative melodic interpretation, amongst other things, that really helped me understand the dynamics of songs and the intricacies of songwriting. I now have a creative outlet unrelated to my profession (and therefore remains an outlet!) that has also enriched my writing practice and taught me something different about creating poems." "I have been studying with Andrew for about four months now and I have committed to a full year of study with him. It takes time to learn an instrument especially for someone like me with a busy schedule. He has been very patient and flexible with me and I appreciate his relaxed and easy-going attitude. He has tailored my lessons to fit the kind of music I want to play while keeping me grounded with basic music theory exercises as well. An added bonus to studying with Andrew is the beautiful church where the lessons are held on Church Avenue in Brooklyn. I highly recommend Andrew as a piano teacher!." Andrew is an excellent teacher for adult beginners. In addition to being really flexible with scheduling lessons, he is incredibly patient and encouraging. I tend to get anxious about making mistakes, but he is always really easygoing when I do. He lets me choose what music I’d like to learn and finds the perfect arrangements of the songs to suit my skill level. One of the best things about Andrew is that he is extremely creative in his teaching methods and appeals to different learning styles. When I’m struggling with grasping something auditorily, he’ll present it to me visually or kinesthetically. He has played, sang, clapped, chanted, notated and drawn diagrams, all for my benefit. He will even let me record a video of him playing so I can watch and listen at home. The combination of all these different approaches is giving me a really well rounded understanding of piano. Additionally, Andrew is great about contextualizing what he’s teaching. I now have a better understanding of classical, jazz and pop music patterns. He is super open to questions, and if he doesn’t know the answer, he’ll go find out. Most important though, Andrew makes learning piano fun. I look forward to my lessons every week. "I think Andrew is the best piano teacher ever. He teaches you what to do for the piano. I have fun while I'm playing." "Andrew is talented, inspiring, and will motivate you to learn." "Andrew is the absolute best. He was careful to ask what I wanted out of my lessons, and delivered just that in a way that far exceeded my expectations. He is always crystal clear and concise and steers every lesson in just the direction it needs to go, answers all of my questions in an understandable way, is always punctual and professional, and always prepared with options for exercises and teachings. I repeat - he is the BEST!" "Andrew is the greatest piano teacher that has taught me!!! :D :D :D"
"Andrew is awesome. I have been playing drums for 13 years and have been wanting to expand my musical horizons for some time now, after a few goes at guitar and piano by myself I knew it was time to find a teacher. Piano made way more sense to me then the guitar so I hopped online and found Andrew. After only a few lessons Andrew had me up and running on things that I would not have found on my own. He is patient, kind and I always look forward to our lessons. He always gives 110%." 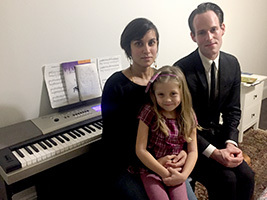 My daughter and I have been taking piano lessons with Andrew for the past 6 months. Andrew is a truly student-centered teacher, providing patient instruction with an encouraging demeanor and an ability to teach both kids and adults. He's also willing to teach different genres of piano music, which has added a delightful variety to the lessons. We highly recommend him! "One reason you should have Andrew as your piano teacher is because he lets you do all the songs you want and also he gets you stickers and also each week that I practice 10 minutes every day he gets me a Panini pack [of NBA stickers]." "Starting beginner piano lessons as an adult in my mid-30's, I of course had some baggage: ('Is my brain still capable of learning an instrument at this age? ', etc..). But I see now that, yes, it is most certainly capable. I've been taking lessons with Andrew for a few months now, and I can already play entire songs that I never thought I'd be playing this soon into the process. Andrew has an optimism that any person can learn to play, regardless of age--but it's an optimism borne of the reality that he's been successfully teaching both children and adults to play the piano for years. The proof is there. And this has in turn helped me to become more optimistic about my own chances of learning the piano, as I have come to realize that this is something I'm perfectly capable of doing too. ...So, I am indeed doing it. --And for this new education, I have Andrew to thank. I would recommend him without hesitation to anyone who's interested in learning how to play the piano." "Andrew has the perfect approach with beginner adults. After a few lessons you already have a piece to play. While you enjoy your playing, Andrew delicately teaches you theory. His passion for music is contagious. Yes, Andrew is more than a piano teacher. He is a real musician." "Andrew has been teaching our 6 year old son how to play the piano, and he has been great! He has been very enthusiastic, patient, easygoing, and keeps my son engaged. He makes the lessons fun, and my son looks forward to the weekly lessons. Andrew also transcribes some of my son's favorite songs so that our son can practice those as well. "After a long break from playing the piano, I started piano lessons with Andrew this summer. His lessons have brought back my love of playing the piano. I've learned to play some of my favorite songs from artists such as Ben Folds Five and Carole King. He is very patient and helped me work through difficult passages. Also he has a great ear and figured out passages that weren't included in the sheet music to get a more authentic transcription." "Andrew is a fun piano teacher and he lets you have dinosaur stickers." "I have always suspected that piano teachers don't like having me as a student. When I first began taking lessons in the early 90s, teachers wanted me to learn classical songs while I mainly wanted to do top 40. I stopped taking lessons for many years but in 2014 I decided to take lessons again. The first teacher I emailed never even responded! He must have been intimidated when he heard I had lots of experience. The second teacher set up an appointment time, but then no-showed the lesson! I was ready to quit when I found Andrew's website. His rates are very fair and he is always prompt to each lesson. And unlike many teachers, he doesn't force me to learn what he likes; rather, he lets me decide what I want to learn and that's the way to keep me interested. He gives great advice...even on songs that he has never heard before. It's great to know that there really is no limit to what I can learn. An obscure instrumental song that plays during a film I saw? He can teach you that if that's what you want to learn. The advice that he gives is very helpful and I have been enjoying my return to the world of piano instruction." "Andrew is a gifted and patient teacher. He is very open and knowledgeable about many different styles of music and has a great understanding of music in general. It has been such a joy taking lessons with Andrew and my skills on piano have definitely improved! I really appreciate how Andrew tailors each lesson to my individual ability and tastes and how he has helped me to reach my musical goals. I feel very comfortable with Andrew and he's a flexible and thoughtful instructor- plus it's a lot of fun! i'm so happy that I decided to work with Andrew- learning piano from him has been a real treat!" "Andrew's lessons are good and they're fun and they're awesome and they're cool." 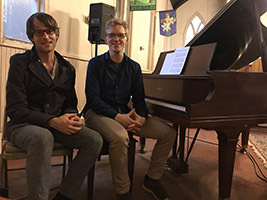 "Working with Andrew to learn piano has been a very great experience. He is incredibly patient, thoughtful, encouraging and easy to get along with. We have fun together singing lyrics as I play along. As a teacher, he is quick to notice where I need support and quick to come up with strategies and techniques for me to use to improve that are appropriate for my level. I found Andrew's contact information in a local store and when we met, I was a complete beginner and did not have any prior experience with any instruments. I knew I wanted to learn how to play a couple of my favorite songs and now we have been practicing together for eight months. From the start, he made me feel comfortable and it is because of his patience, love of music, humor, and reliability that I have been able to come so far." "Andrew has successfully gotten me back into playing piano after taking 10 years off. He helped me learn a tough song I requested (Maple Leaf Rag) and has also thought of many other fun and challenging songs. My understanding of music theory has improved, too. He's flexible with scheduling and has made piano a lot of fun!" "Sarah has been a great piano teacher for me! She has helped me develop a practice regimen, learn to read music, and even gain confidence performing! She is patient and allows me to work at my own pace while also pushing me. I highly recommend Sarah to students of all levels!" "In the time I worked with Andrew as my teacher, I went from novice to playing well to being able to write my own songs. Andrew is the best piano teacher I could've asked for, not only giving his students the skills to play piano and sight read, but adding that extra magic; with Andrew's patience and encouragement, I not only became a strong piano student, but became confident of my own songwriting ability. Andrew knows when to push, but has a sweet, easy manner that makes lessons as fun as they are challenging. I'm extremely grateful for my lessons with Andrew, because they taught me to become not just a piano player, but a musician." "Andrew is pretty great as far as piano teachers go. From day 1 he had me playing a little bit of music (and mind you, I had VERY little experience playing piano beforehand). He teaches at the same pace you learn at and is extremely patient, understanding, and encouraging without having to sugar coat anything. I tried taking piano lessons a year before with another instructor who was very caught up with theory (which isn't a bad thing - just not the best method for me to learn). Andrew adjusted to my learning patterns and now, I can play songs that I had wanted to learn for years. I sound better with each practice and each class - which for me, is invaluable."